It is with a heavy heart that I am writing to inform the club members that Chris Kennedy passed away on April 12, 2017. There will be a reception to celebrate Chris's life next Saturday at my home. Please contact me directly for particulars if you can join us. 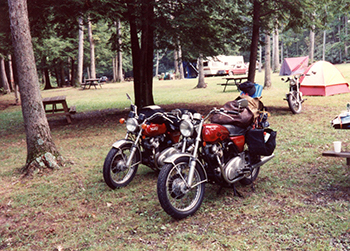 It has been a few years since Chris was active in the club but he remained a Norton enthusiast even though his heavy work load limited his time for motorcycling. Christopher Douglas Kennedy, age 60, of Washington, D.C. and formerly of Roanoke, Virginia died Wednesday, April 12, 2017. 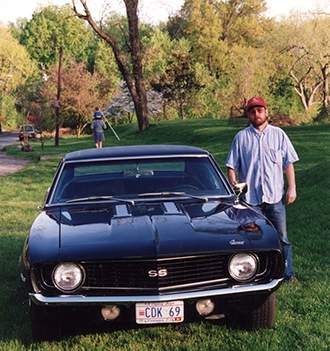 Chris enjoyed restoring his beloved 1969 Chevy Camaro and vintage British motorcars. He was a member of The Nations Capital Norton Owners Club and also liked deep sea fishing. Chris was preceded in death by his parents, Douglas Kennedy and Bobbie Flagg. Surviving are his brother, Michael Kennedy of Salem and his sister, Elizabeth (Liz) Kennedy Coy and her husband, Billy of Stafford. A niece, Katharine Kennedy Rucker and her husband Marc, and two great nephews, Thomas and Grant Rucker, all of Roanoke. One nephew, Joshua Coy and his partner, Ali Marie Bailey, and her son, James , all of Fredericksburg. Two lifelong friends, Joe Prandoni and Steve Sayer, both of Bethesda, MD.